It is hard to imagine what life for Elizabeth would have been like. Her mother Martha Halstead (1805-1845) passed away when she was only four years old. The large family of nine children all had to pull their weight to support the family. 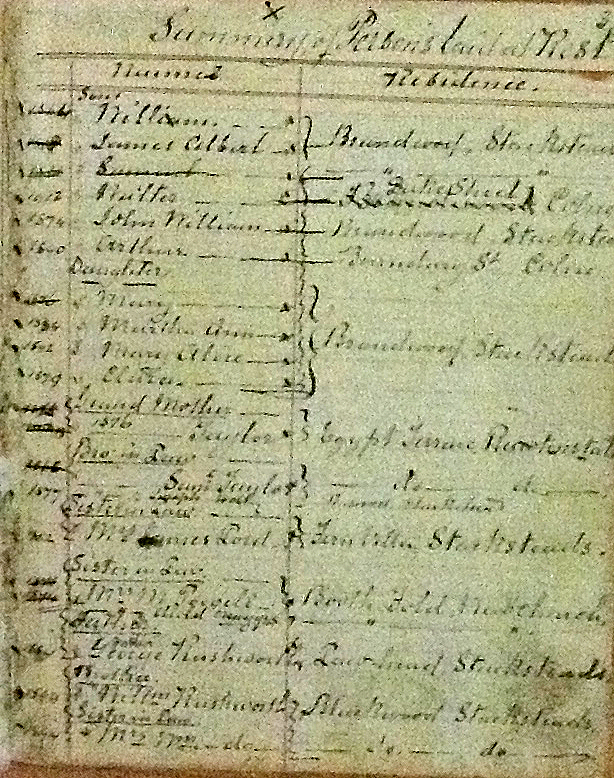 In the 1851 census five children including Elizabeth worked in the weaving industry, while her elder brothers worked as quarry men. 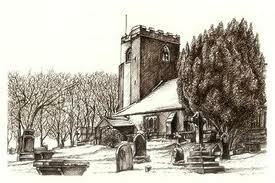 At the age of 17 Elizabeth married William Taylor (1833-1928) at St Mary le Ghyll Church, Barnoldswick on 17 July 1858. William was the son of Richard Taylor (1802-1868) (Road Surveyor) and Peggy Halstead (1802-1876). Peggy was sister to Elizabeth's mother Martha Halstead, so William and Elizabeth were not only cousins, they had probably known each other through their childhood. Their first child William was born later that year. He was the first of 16 children born to Elizabeth and William between the years of 1858-1885. As was common in these times many of the children died in in infancy or at a young age. The evidence of the deaths of many of her children is clear to see in her note book, where she lists family members she has laid to rest. The list includes, among other family members, six sons and four daughters. 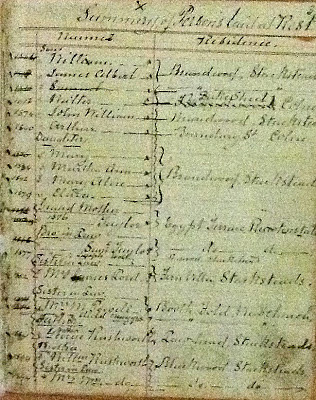 The 1861, census shows William and Elizabeth and two children living at Nicholas Folly, Spotsland (near Barnoldswick) and her father George Rushworth and some of her brothers and sisters were living next door. William is described as being a farmer and cotton weaver who employed four laborers. The family continued to live in the Spotsland, Barnoldwick district until sometime in 1885 when they moved the family to 31 Boundary Street Colne. (Their daughter Lucy was born in Colne on 16 September 1885). William took up a new position as Assistant Survey to the Social Board in Colne. We can only suppose what influenced Elizabeth's interest in nursing. Perhaps her skills came from caring for so many children and her elderly father and parents in law. Perhaps it was a skill that was passed down through the family, we do not know. However, her note book gives details of many years of nursing and caring for family, neighbours and others who were in need. The respect and place that she had in the community is reinforced by the number of Doctors in the nearby districts that she supported and worked with while caring for the sick. Not long after moving to Colne, (1888) Elizabeth joined the joined the 4th Division of the St Johns of Jerusalem Nursing Division that was based in Colne. Elizabeth thrived in this environment and was keen to learn and add to her nursing skills. In 1891 she gained her First Aid Course Certificate for Instruction and was appointed Inspector of Stores and First Aid Officer. Despite her commitments to a large family Elizabeth continued to study and in 1892 received her Certificate for Efficiency in First Aid. Her aptitude and untiring support of the St Johns Movement saw her appointed Lady Superintendent for the 4th Division of St Johns and she held this position for 25 years until she resigned at the age of 81 in 1922. Elizabeth took a prominent role in the development of the St John's movement in Colne, including organising work and collection of funds in order for the movement to continue to carry out its work in the community. The 1901 census tells us that William and Elizabeth were living in 9 Duke Street, Colne with five of their children. William was employed as a clerk at the Corporation Yard (what we call the Town Council today). You would think at the age of 60 Elizabeth would be looking to start taking things a little easier. No!! with the threat of War, life was about to change for all of England and Elizabeth did not sit back and watch it happen. Stay tuned to hear more of Elizabeth's story.